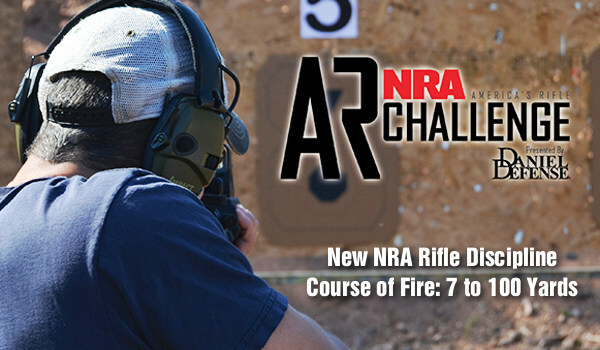 The NRA America’s Rifle Challenge (ARC) is a new short-range rifle discipline designed to develop practical shooting skills using modern sporting rifles such the AR-15. NRA-ARC is designed for shooters of all skill levels. With all targets positioned at 100 yards or less, almost any outdoor centerfire range is capable of hosting ARC matches. No pits or swinging target holders are required. The ARC is a close-range, action-oriented discipline. The course of fire features targets placed from seven yards to 100 yards. Some stages also incorporate magazine changes and the use of barricades. 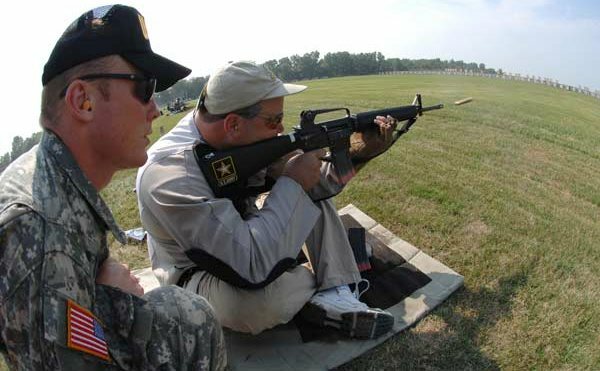 ARC matches involve movement, as competitors transition into multiple shooting positions: standing, kneeling/sitting, and prone. NRA-ARC is NOT limited to AR-15s. Any semi-automatic detachable magazine-fed rifle can be used. There will be three classes of firearms: Iron Sights, Optics Limited (with one non-magnified optical sight), and Optics Open (maximum two optical sights, one of which may be magnified). Share the post "Short-Range Action — New America’s Rifle Challenge Discipline"
This September, the NRA will host The 1st Annual Trijicon World Shooting Championship (WSC) at the Peacemaker National Training Center in Glengary, WV. Intended to be the “mother of all shooting matches”, this event involves four days of multi-discipline shooting at ranges from 15 to 1500 yards (and beyond). 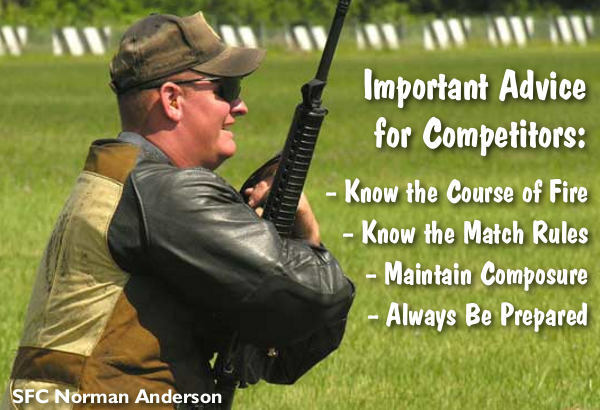 Competitors must be skilled with pistol, rifle, and shotgun. 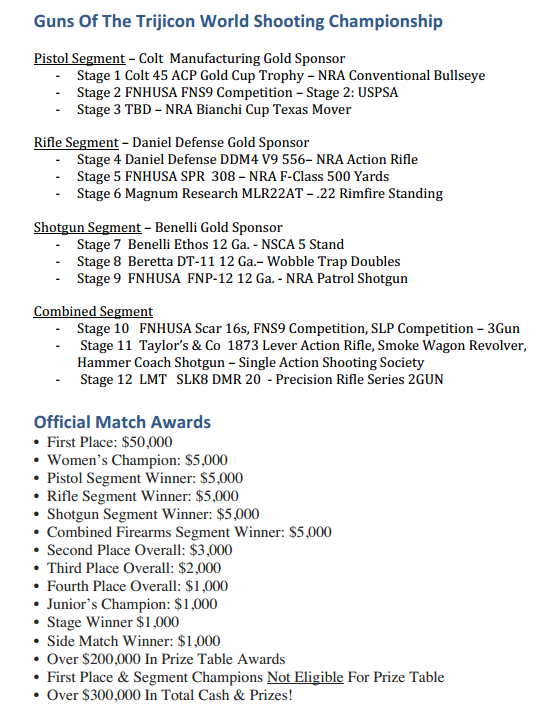 The goal of this match is to assemble the top 400 shooters from all the leading shooting sports, and then crown one undisputed World Shooting Champion. The “top guns” will share in $300,000 worth of cash and prizes. The organizers of the WSC have just published the Official Rules and Course of Fire for the 4-day event. This is now available, for free, in PDF format. 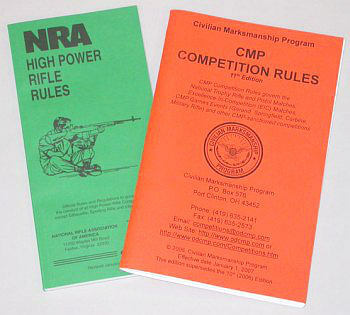 This WSC Rules Document provides a Match Overview, Match Scoring Rules, Description of each stage, Course of Fire for each stage, and List of Firearms for each stage. CLICK HERE for World Shooting Championship Rules and Stage Descriptions. Basic Stage Description: The NRA F-Class Stage is [a] long range bulls-eye course of fire, and is governed by the NRA F-Class Rule Book. In this particular stage an FNH USA SPR 308 Rifle with a	20	inch barrel will be used to measure a shooters ability to shoot at long	range. Course of Fire: From the 500 yard line, shooters will fire a total or maximum of 3 sighter shots	and then fire a total of 10 shots for record on	the official 500 yard F-Class target. Shooters will	have a maximum of 10 minutes to	complete the “for record” period of fire. All shooters will compete over the course of four days in twelve equally weighted, officially sanctioned disciplines from various shooting sports. All firearms and ammunition will be provided for each event thus shooters will compete with common firearms and ammunition. This will also alleviate the need for new equipment to be purchased for unfamiliar events; and assist with international and domestic travel for all competitors. 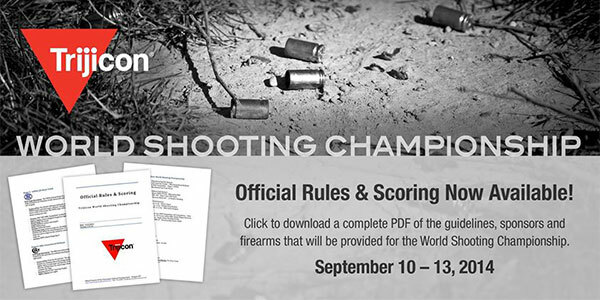 Share the post "World Shooting Championship Rules and Course of Fire"